September has always been especially kind to me, and no matter how many years out of school I've been, that first day of school butterflies-in-the-stomach thrill of starting afresh always stays with me. This month, now half gone, has been spectacularly mild and beautiful, fully autumn. Goldberg wanted to insure that - since I had an exceptionally crummy summer, where we didn't get to spend much time together or go out shooting - that we made a getaway plan for my birthday. It was decided we would take a trek to the Hudson Valley, near Poughkeepsie, where we would lay our heads at the Hotel Sierra in Fishkill, and spend the majority of our time seeking out the strange and abandoned, and the balance driving around and grazing on some unexpectedly decent food. 6am came much too soon on Saturday morning, September 11th. Away we went making (arguably) the mistake of going north on the east side of the river, by way of the GWB and through neverending Yonkers, Tarrytown and Ossining. Alternately shady and posh in equal measure (but equally unexciting visually) - it wasn't until we cleared Peekskill that we finally started to feel like we were leaving the burbs behind for the wilderness. Despite it looking like the wilderness, it seemed that every backroad we wandered down ended up leading us to a hidden community of swanky houses tucked deep in the woods. We were starting to lose a little gusto, now 6 hours on the road, we were wondering if we were going to find a reason to hyperventilate and drive off the road from The Thrill of X. Goldberg had a short laundry list of major sites that we considered checking out - psych hospitals, boarding schools etc and by this point in the day, we had made it up to Poughkeepsie proper and wanted to check out Hudson River State Hospital... which was essentially impossible to miss from the main route going through - looming high on a hill, the buildings still seeming sinister on a gorgeous sunny day, surrounded deeply by forest and brush. We drove all around the property, calculating best point of entry, parking, in the meantime spotting some other interesting buildings not part of the hospital property. Perhaps we chose the most obvious point of entry, but I was emboldened and happy to be out of the car, but as I walked just beyond the gate I saw a pickup truck that was semi-concealed by a shrub down the road a hundred feet away... which caused me to walk back out as quickly as I had walked in. There was much hand-wringing and neck-craning but we decided that we'd rather not take the chance that it was an occupied security vehicle. Slightly defeated we went back to the car and drove over to the nearby abandoned Hoe Bowl in Hyde Park. 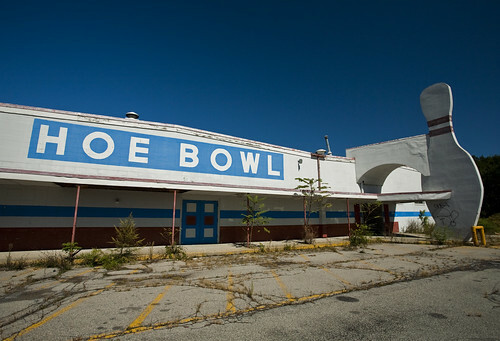 Part of a local chain of bowling alleys - this had the most remarkable exterior of all that we encountered - very 70s, with an enormous bowling pin entrance/doorway. Creeping into afternoon, we were getting a might peckish and thought checking out Poughkeepsie a bit more thoroughly and finding a bite to eat. The city was surprisingly quaint with a fair amount of restaurant offerings, though we just wanted a quick small bite so as not to ruin our appetites for dinner. We found Soul Dogs - yes, a hot dog cafe - which offered a broad range of unique toppings for beef, chicken and tofu dogs. After a couple tofu dogs with vegan chili and some quinoa salad, we drove around the sidestreets of Poughkeepsie and too a mini walk around a sculpture park that adjoined a derelict magenta pigeon roost-building (so we were told by a man sitting in the park). 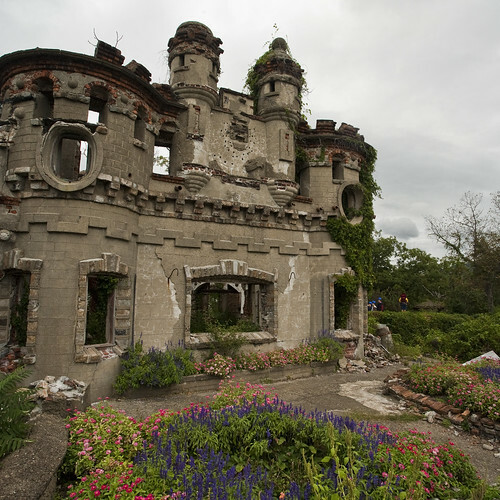 We headed up towards Rhinebeck hoping to find one of the long-abandoned mansions built overlooking the Hudson, known as Wyndclyffe, built in 1853. After much circling and doubling back and forth, we found the road that lead back into the woods where she stands, though just barely. There was a fence circling the property which was quite overgrown and the trees and brush were preventing getting a good angle on the façade. It was clear from our vantage point that there was almost nothing left of the interior structure, and now even the exterior which was quite ornate, was sadly collapsing in multiple places. It appeared as though there was barely any roof left towards the center. It was really unfortunate to see such a beautiful building waste away like that. 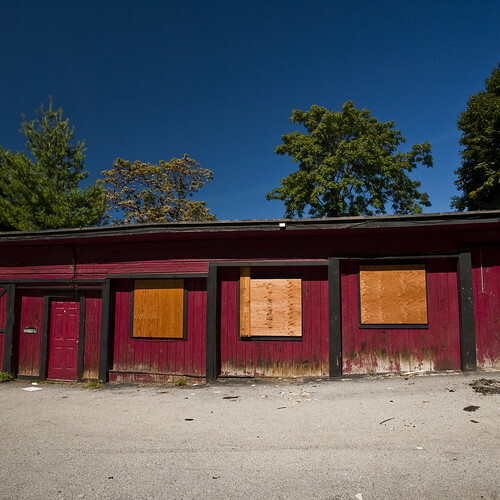 If the current owner is doing anything to preserve or renovate it, it is not apparent in the state it is in. 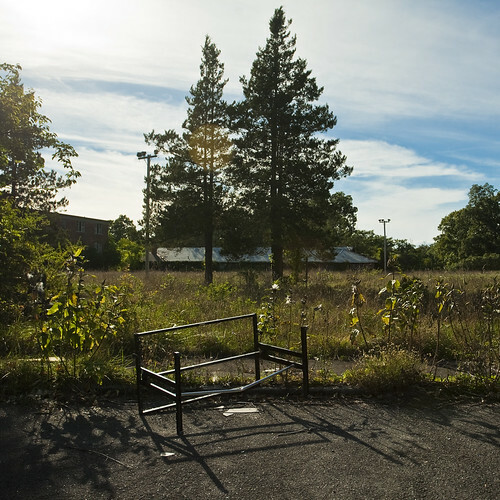 While we were cruising about looking for Wyndclyffe we passed by a fenced off property with a "For Sale" sign on it, beyond which we could see a couple overgrown 60s-70s style school buildings on the top of a hill. The pickup truck that we were behind at the time (with a four-wheeler in the back) pulled into the gated area and gave *us* the eye as we looked back at them, craning our necks to see the property. Having made a mental note to return post-Wyndclyffe - we made our way back to the gated property. We saw no signs regarding trespassing so we made our way up the hill, sans tripods, towards the visible buildings and out of sight. 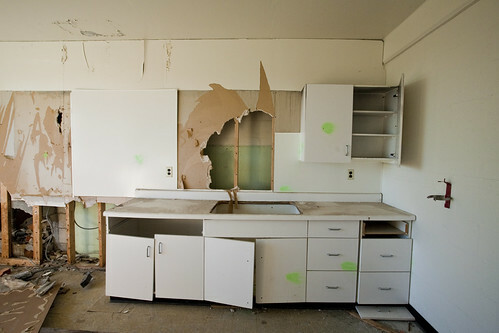 The first building we came across - Culhane Hall - felt like a dormitory from the 70s - small rooms littered with single bedframes, wardrobe cabinets and a couple larger meeting rooms and stalled bathrooms with showers. 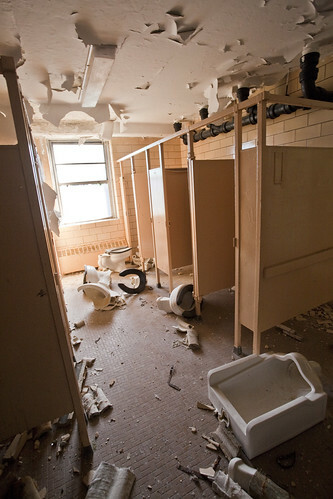 It was heavily vandalized and clearly been thoroughly picked over by scrappers, with plenty of asbestos pipe casings scattered around. Walking out behind Culhane we found ourselves in a courtyard surrounded on all sides by buildings, some of which looked like they had suffered small fires and/or explosions. 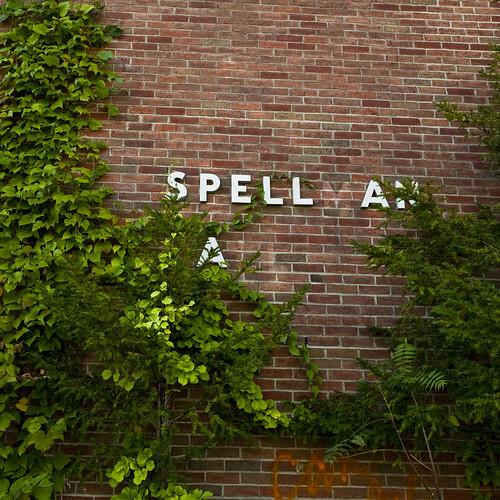 As we approached the next closest building labeled "Spellman" - with a huge steel cross by the name - we saw a black cat scamper out of the bushes and into the building. 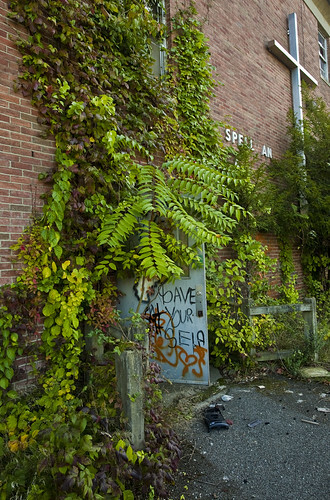 Throughout Spellman, there were huge holes in the brick and cinderblock walls. 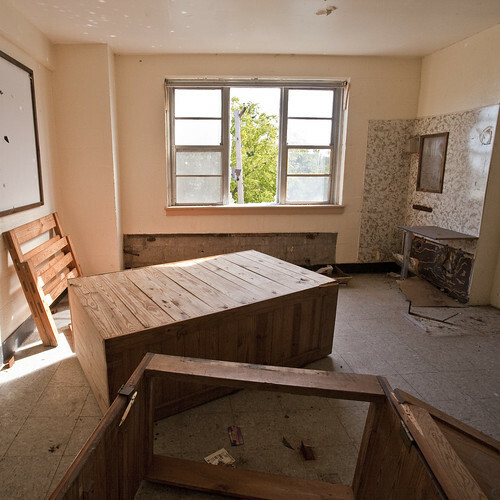 The rooms here were bigger with boards on the wall as though they were offices and classrooms, with some kitchen, private bathroom and laundry facilities. Goldberg had moved a few rooms ahead of me while shooting at one point, turning a corner ahead so we could no longer see one another. Suddenly I hear, "Laura oh my god come here quick, quick!!" As I move in the general direction of his voice, I hear groaning shouts and something about "Its trying to get out the window!" and I can make no sense of what I am about to see until I am just about to turn the corner to the room he is in and the black cat comes tearing directly at me in a full gallop, breezing by my leg close enough for me to feel it, kicking up a trail of dust in its terrified wake. Goldberg informs me that the cat was in the room he was in and spooked, then attempted to leave the room by way of the one window on the second floor that still had glass in it - launched itself thusly, bounced, freaked out and left running. Had it not had glass in it, she quite possibly would have leapt to her death. When I saw her earlier, the fact that she ran off was a pretty good sign that she was feral, not rabid. Kitties are much preferred exploration company than raccoons any day, though Goldberg was disturbed by the black cat path-crossing implications. *note: we did manage to not come to immediate harm during our getaway weekend, though the potential of mesothelioma in our future is still an unknown quantity. we did see black cats at least three times over the course of the weekend. The next building we approached appeared to have had the most extreme damage, missing what was likely a three-story bank of windows around a central staircase. 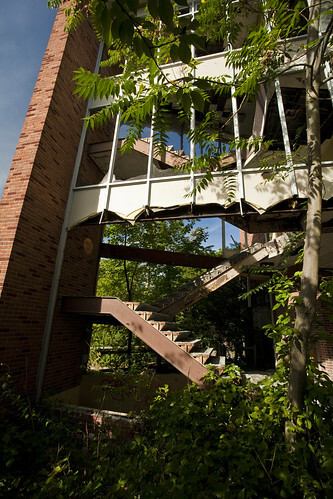 Not feeling like taking those stairs was the best route, we found a back door into what appeared to be a slightly nicer residence hall, suites possibly for older students or teachers we speculated. There was moss covered carpeting through much of the second floor, bigger windows. Furthest from the road, we came upon a cluster of large buildings which we surmised was the gymnasium. 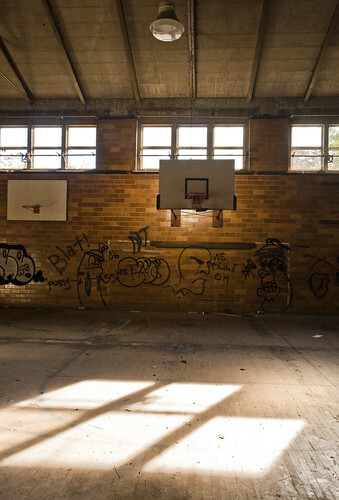 Immediately upon entering, we were greeted by the rotting wood-floored basketball court with a peeling stage. The scoreboard had a set of initials (CFMA vs. Visitors) and in center circle of the court's floor, just barely visible were the words HOLY CROSS. 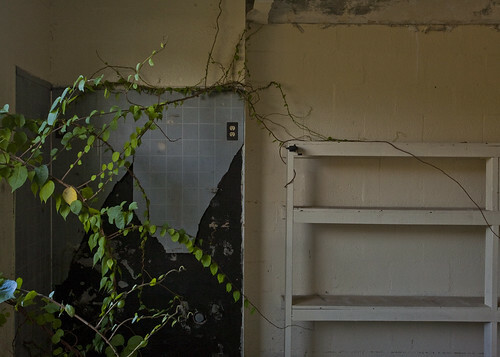 Goldberg realized that he had seen photographs of this very facility while he was searching online for locations for us to explore, though he couldn't remember the exact function of the place. The sun was getting low in the sky, we had left our tripods in the rather conspicuously parked car so we decided to cut our losses - which we later found to be another gymnasium and a swimming pool - and head back south towards our hotel, so we could scrub the asbestos out from behind our ears and get our dinner on. 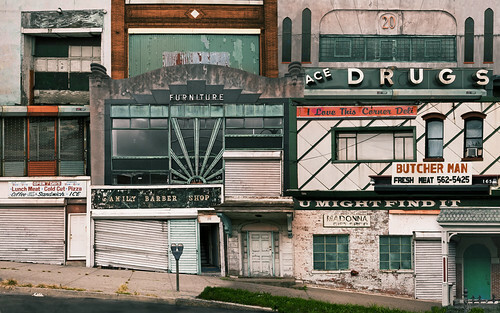 On our return southward, we were excited to see a functional drive-in movie theater close to Poughkeepsie. The pitfall was that it was playing two questionable movies, the more appealing of which was a Drew Barrymore romcom. Though we were both exhausted, it would still be quite early when we would be done with dinner, so we both considered - just to enjoy the experience of a drive-in movie, which is a truly rare beast these days (at least in the Philly region) - returning later for some romcom torture. One shower and a change of clothes later, we made our way back to Poughkeepsie in search of what promised to be a very unfancy pre-birthday dinner of Vietnamese food at the Saigon Cafe. Since I was able to convince Goldberg he needed to give Vietnamese food another chance after a displeasing round several years ago that put him off completely - I have been unable to get him to stop, which for me is great. The look of the place was somewhat questionable, the front window papered with laminated images of menu highlights did put me in mind of seedy Chinese joints in the hood. One look at the menu though and I was swayed to give it an enthusiastic go. Not the multiple pages one might see at our favorite local Vietnamese place, but a good deal of variety and not a hint of non-traditional Ameri-Chinese'd upped dishes. The owners were standing in the small dining room- a husband and wife duo - watching a football game on the tv. As soon as we arrived the wife disappeared immediately into the kitchen and the husband seated us and chatted with us. After we placed our order we took the opportunity to admire the wacky, eclectic "decor" - which included red checked tablecloths, more laminated photos of menu items, huge prints of photographs taken by the owner in Vietnam in the 70s, assorted coffee paraphenalia, and duplicates of every news item where the restaurant had been mentioned such that no matter what direction you were facing in your seat, you could read the same articles. After spying me put some sriracha sauce on my shrimp spring roll, when he brought out our main dishes he notes that he saw that I like the spicy sauce and offered to give us some of his special chili sauce that he makes himself... which he came over and spooned onto both of our búns. It was all so good, even the fried spring rolls you could tell had just been made up moments before by hand and were super delicious. The only letdown was the lack of desserts available there. Since we had decided to take a miss on the drive-in due to poor movie options, having a look round for something sweet instead. Almost immediately, we drive by a second drive-in theater, this time playing The American which was one of the few movies running either of us had any interest in, only problem was the showtime was almost two hours away. Just around the corner we stumbled upon a mega-kitschy ice cream parlor and we were set. Drawing it out as long as possible, we caved and headed back to the hotel, still amazed that we had managed to find without really even trying all of the things we were hoping for, though we ended up passing on half of it due to our inability to keep our eyes open, especially post-dairy indulgence. Birthday morning, I was allowed to sleep past 5am all the way to 7am, which felt like sleeping in. After breakfast buffeting and packing we were on our way towards Newburgh on a rather gray morning. 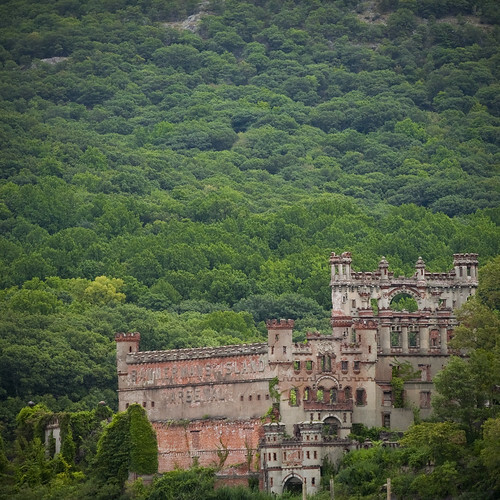 Our main goal of the day was to make it to Bannerman's Castle on Pollepel Island before the rain started to fall. But first! 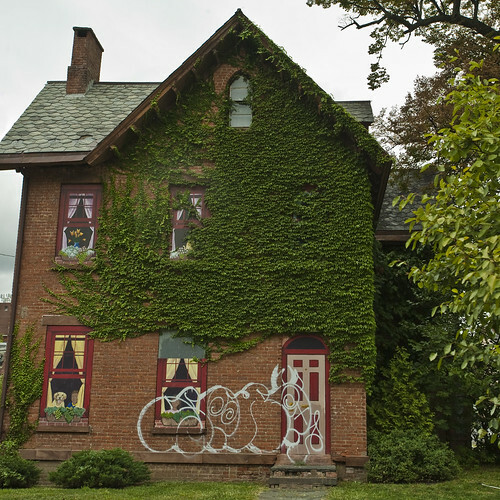 We took a driving tour of Newburgh and its quirky suburbs... all of which was reminiscent of North Philly. After a couple hours of cruising around photographing façades looking rather suspicious, including me leaping out of the car at the corner of Shady and Dodgy to photograph some amazing dimensional mid-century metal typography, the group of old guys chatting next door all stopped to stare and then one guy calls out to me, "Hey! Those are some nice boots!" - I thanked him as I ran back to the car. A small boat took us out to Pollepel Island, we donned out hard hats and half the group scaled the hill towards the front of the castle/armory. Due in part to Francis Bannerman's dubious construction in the first place - he was a man with no architectural or engineering training, preferring to collect details he saw in other buildings, drawn on napkins and hand them over to laborers who were told to 'build me something that looks like this', regardless of how structurally sound it was (or wasn't) – and in part to a very recent collapse over the winter, tours are no longer allowed to get very close to the building for fear of further collapse. There are really only two walls left to the main portion of the armory building. We worked our way inland a bit toward the equally decaying concrete and brick summer residence (which I didn't know existed). The Bannerman Trust had planted the gardens around the house which were in full bloom. 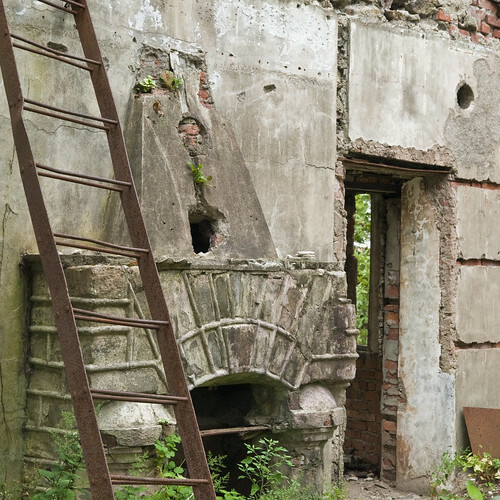 Though you couldn't go inside – what was left of the structure – you could still walk right up to it. Though it was tempting, the decorative brick frills overhead looked quite unstable. Off to one side there was a two-story concrete "sleeping porch" where the family apparently hung hammocks and the breezes blew through the windowless open sides, providing an escape from the worst of the heat. Further down the hill there were some gardens where Lady Bannerman grew flowers and vegetables. By the time we had finished making our way back up the hill after the tour was finished the rain started up and was coming right down by the time we were boarding the boat back. 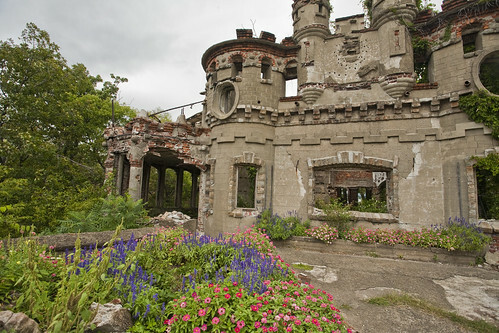 Deciding it wasn't quite nice enough to pay a visit to Storm King, we headed out of Newburgh hoping to find some interesting abandoned sites I had made a rather extensive list of before we came up. Sating our hunger at the surprisingly good Bukhara Bistro, we headed for one of many tiny nearby towns where we would discover quite a few of these locations - several were too conspicuous, others demolished and a surprising number were actually inhabited and/or being restored. While searching for one of these locations, we found ourselves in the village of Kiryas Joel. I thought it a curious name for a town but I didn't really do too much digging beyond the streets we might find something of interest. The moment we passed a sign noting we had entered the village it was as though we had suddenly been thrust deep into the Old Country... or maybe Brooklyn. The streets were teeming with Hasidic Jews, not just the sidewalks - there were so few cars and so many people they were overflowing into the streets, with tons of children running around. In such an incredibly remote area, having been through very rural communities where we had barely seen anyone at all, the extreme density of people was quite a jolt. 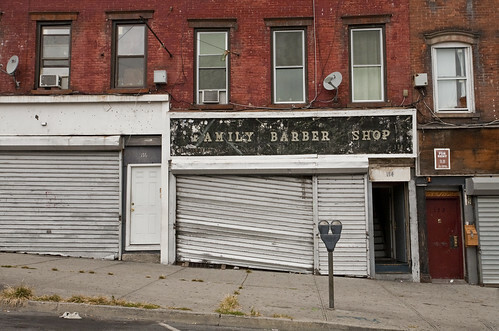 I did some more reading and found that the town is privately owned town controlled by the Hasidim - it has the highest poverty rate in the nation, with the population size doubling approximately every ten years. It seems there is quite a bit of controversy surrounding the village and it relations with its neighbors.